Here are some unusual caps from the lovely little sequence in the hearthside scene early in FotR, when Gandalf tells Frodo about the Ring. In it, having learned what the Ring is, Frodo, still quite plucky, says they'll hide the Ring away. After all, know one knows it's there. Frodo stops suddenly and turns, his misgivings written all over his face. Tentatively he adds, "... Do they, Gandalf?" Plenty of caps are out there from this well-loved scene, so I wasn't going to bother capping it. But, watching this line delivered in the "Teaser Two" trailer on the TE Extras, I thought, "Why do these caps look so striking? I am just rivetted by Frodo's face in them!" After I looked and looked at them, realisation dawned: "Ah, ha." Maewyn, in a comment below, said she could discern a bit of the Bag End scene in the Teaser One version of these caps. I know that our monitor, even though we have the "brightness" turned all the way up, is old and tends to produce images that are darker than what other people see (hence I sometimes end up producing washed-out images or crude-looking manip effects, unknowingly). So, I went back to the caps I had made and lightened one of them up. Sure enough! Bag End is there in the background. They merely hightened the contrast of these caps for use in the movie trailer. Thanks, Maewyn, for providing the correct answer to the difference: they intentionally darkened the shots to increase the dramatic effect. However, in the FotR trailer, the background is not Bag End nor is it blue screen. It is inky blackness. The heightened contrast between the light and dark in the image dramatically focusses the viewer's attention on Frodo's face in this little moment. His face is the only thing visible in each frame. I have read several Frodo fans tell that when they saw the previews of FotR, when the trailer got to, "Do they, Gandalf," they melted. They were in love. Looking at these caps from the trailer, I can see why. Youth With a Ram (also called St. John the Baptist With a Ram), c. 1600. Now. Here are ten "Do they, Gandalf" screencaps from Teaser Two, from the FotR TE DVD Extras. You know, I did notice that when I saw the trailer in the movie theater that scene gave me the shudders. I was already pretty worked up about seeing that trailer for the first time.. so I just figured that was it. They also did some sound effects that added some emotional punch to that brief scene and I thought that was also part of it. I hadn't noticed the change in background and shading that gave it more of a feeling of foreboding and fear for the safety of the Shire. Yes, it really cranked up the drama. All in all, the trailers were all terrific. No wonder everyone was in a tizzy. Teaser Three, which I didn't take any caps from (because I already had them), was especially wonderful for Frodo fans. From watching it, told from Frodo's POV mostly, you'd think LotR were a film about Frodo. Of course, FotR really was more Frodo-centric than the other two. I love the comparisons with Caravaggio’s chiaroscuro style. That is spot on. I admire Caravaggio’s work not only for its true to life sheepherd-with-dirty-feet-paying-homage at the birth of Christ, but also because I find it very moving. Here the trailers were very few and far between, on TV or at the cinema. I remember being glued to our channel 4, when the advertisements were due to be shown, in order to catch a glimpse of what was to come. Talk about obsessed **rolls eyes**.
. But I was just completely away from watching TV and going to films in those days. What I missed! "The Frenzy"! Caravaggio murdered someone? It wasn't man-slaughter or self-defense? What happened? I supposed I should look his whole bio up while I'm looking up everything else. 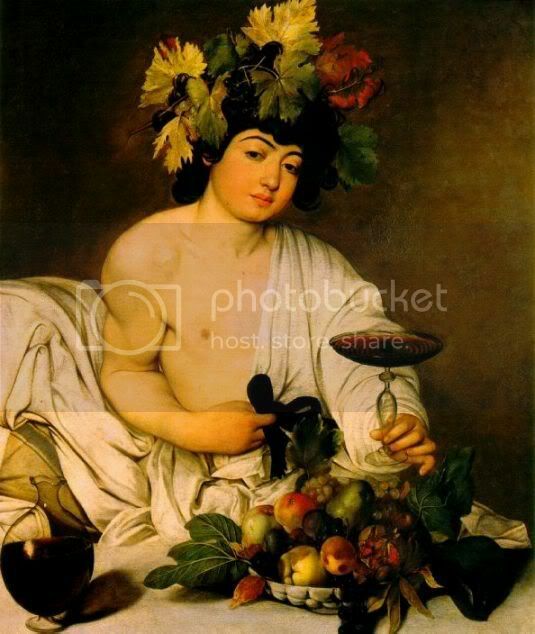 Estë, I looked up Caravaggio and amid the crackpot sites("pervert painter gets his just desserts"), I found a good museum entry on his work and live. The part about his life is towards the end. It sounds as though he was habitually violent, not just in the incident that ended in murder. In fact, he sounds as though he suffered a lot of wretchedness, brought on by his own actions. I think his life would make a great film. His art seems to reflect his extreme nature. I think he's a magnificent painter, myself. Maybe it's just me, but the background looks the same in both examples. The difference is that it is darker in the trailer version. The light seems to be more intensely focussed on Frodo's face, making it glow, and everything else has almost disappeared in the darkness behind. It seems also to be a closer view, with Frodo's face filling more of the screen. It's a far more striking and beautiful version! I may have seen this trailer way back then, but I don't remember it. I was aware of LOTR coming and that I wouldn't mind seeing it at the time, but that was all. I made up for it afterwards, though! Maewyn! I checkedk and you are absolutely right. Our monitor is very dark compared to some (getting old, like its owner), which has caused trouble for me making caps and manips to be viewed by others. They see things that I don't. But I just went to the actual caps and brightened one up to an extreme degree and BY GOLLY! You are right! The Bag End background IS still there, they just turned up the contrast for the trailer. I will go edit my entry now. Thanks! I used to have the same problem with the monitor on my old computer (the brightness was on maximum). I adjusted many, many pictures so I could see the details clearer. When I got my new computer, they looked washed out. Even with my new monitor (flat panel LCD), depending on what angle I look at it, whatever is on the screen looks different. If I'm sitting, it looks normal, if I'm standing, it looks lighter and from below, it looks darker. Maewyn, since I have been investing a lot of time in this screencap adventure, I have been doing a lot of "lightening" on the caps. I only did not do it on the last sets, worried that what looked "normal" to me looked washed out to people with better equipment. Did you notice any of the set of caps looking unattractively washed out? If so, I'd like to fix them. After all, we won't have this monitor forever, and the point of making them was also to share them. If they look substandard on other people's machines, I'd like to go back and bring the brightness back down. No, I can see no problem with the pics you've previously capped. They all look good to me. However, if you want to experiment by darkening one of them a little, then post it, I'll let you know how it looks. Of course, anyone else can give feedback as well as to how they look on their computers. Thanks, Maewyn. You have given me an idea. When I am at work again next week, during my break I'll book myself onto one of the internet-access computers they keep for the patrons. (The ones we use at the circulation desk have access to the internet, but using them for anything but work is strongly frowned upon; usually it's too busy to look at anything for pleasure, anyway.) I'll call up my LJ there, and then take a look at my screencap posts. All the monitors are newish-looking. They should give me a better idea how the images look to others. I get an erie feeling when I look at those two paintings by Caravaggio you posted above. To me the face on both of them looks like the face that Mel Gibson used to portray evil when that group of children was chasing Judas (?) in The Passion. Was that face on the baby Satan was holding too? I'm not sure. I'm creeped by it. I've never seen any other of his works so I'm not judging his work, just them two. Shelbyshire, I did see the Passion, but only once. I remembered thinking the scene with the maniacal children was supposed to be surrealistic (or I hoped it was). The baby's face was supposed to be jarring; the face used was not a baby's, obviously. But intense light and dark was used there, as it was in many of the film's scenes, giving it a "Baroque" look of high drama. I think the resemblance comes from that. I don't think these two Carvaggio youths (above) are supposed to have evil expressions, but the darkness of their faces may invite a sinister interpretation. The top boy's face can't be seen, a steal from a figure with the same pose on the Sistine Ceiling. The lower boy's expression is hard to see, though. Since his big body is fully in the light, that his facial expression is not quite discernible might lend it a "dark" feeling. Here's a close-up of the face that I lightened up. I think the expression is "normal," but I see what you mean, looking at the full picture. 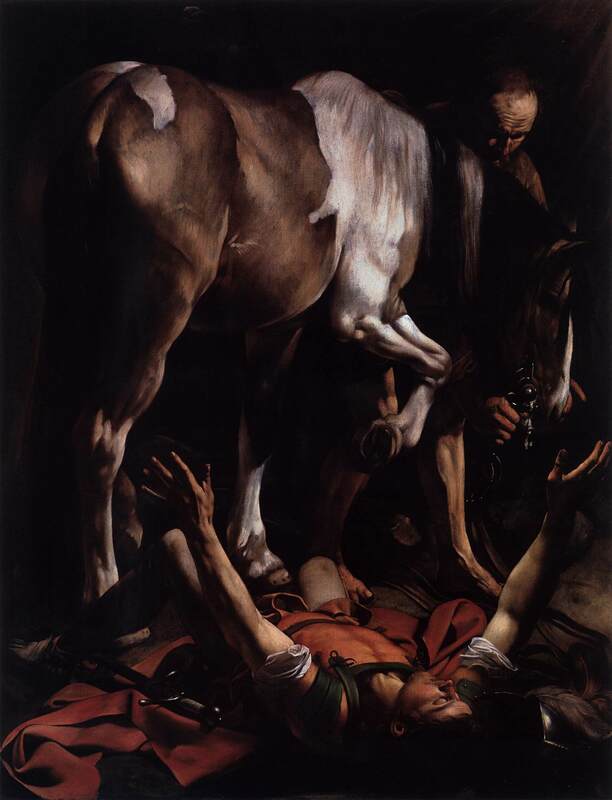 Here's the one I first saw of his, from my art book in college, The Conversion of St. Paul. When I first saw this painting, I said, "WOW"!!!!!!! 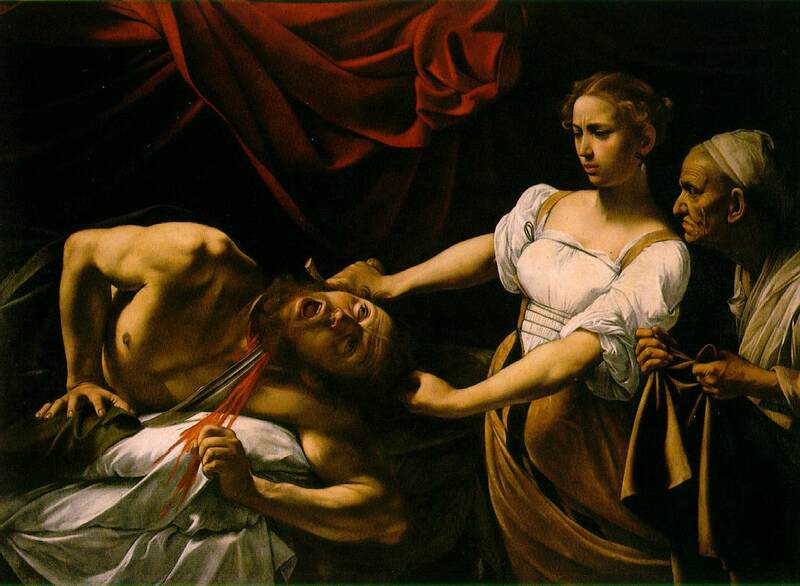 Here's Judith cutting off the head of Holfernes. Yes, it's gory. Again, you can see that he has an intensely dramatic, almost theatrical style. A lot of LotR reviewers mentioned Caravaggion when talking about the "feel" of much of the art design in the LotR films. Here's what is probably my favourite Caravaggio, St. Matthew and the Angel. Again, look at the face of the angel. He looks like a real, not an idealized boy. Not everyone in his day admired this feature. Este's remark (above) that he was a murder (what a sad, violent life he had! ), I found a couple of articles that specifically saw Carvaggio as the artist whose work influenced The Passion. You have a great eye! 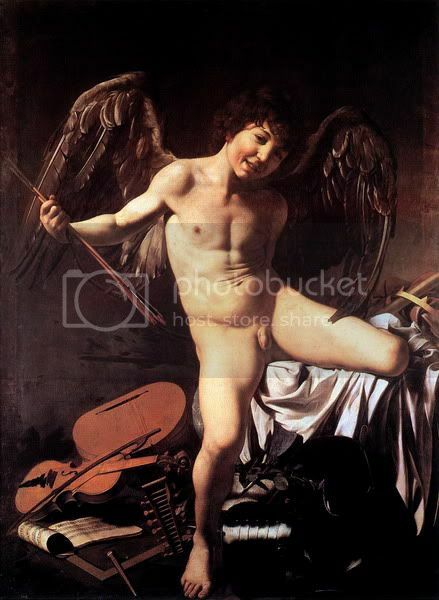 It sounds as though Caravaggio was a non-conformist as a man and as an artist, scandalzing viewers with paintings in which gods and saints were depicted as real people, rather than in the usual elevated, idealized way. He already had a propensity for black moods and an ungovernable temper before he ended up killing someone in a brawl. He spent the end of his life in considerable suffering, still painting from places of hiding, but impoverished and wretched much of the time.